The grey jade bottle: Hugh Moss Ltd. The black crystal bottle: Elisabeth and Ladislas Kardos Collection, no. 7. 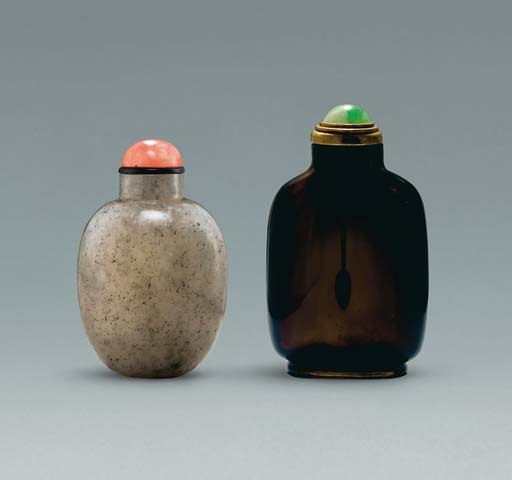 While it may be assumed that pure white nephrite snuff bottles and carvings would have been more popular, there is evidence that there was also a taste for a range of duller materials that may seem visually uninspiring initially. So important to the Chinese audience was this pebble material with it surface inclusions and discoloration that it is recorded late in 1743 that the Qianlong Emperor gave instructions for the improvement of two white jades he had ordered from the Imperial workshops at Suzhou: "Bake the white jade Immortal and horse to create some stains so they look like the Han jades and make an elegant stand for each of them." There is also evidence that he decreed that all future productions of white jade Immortals and horses should be antique-finished to the color recorded in the Kaogu Tu (Illustrated Research on Archaeology). As such, it is possible that the present lot would have appealed to an audience who favoured old jades, while the simple, yet perfectly proportioned shape of the bottle demonstrates masterful command of the formal medium, with its understated perfection of shape. Black or brown crystal, more popularly known as "tea crystal" or "smoky crystal", is an attractive material with a subtle, metallic, inky-brown color. As with other crystal examples and snuff bottles made from flawless, transparent material, the integrity of form and subtle visual equilibrium is achieved by the careful hollowing of the interior, combined with the masterful balance of the outer contours of the bottle.